Black Earth Institute, the publisher of About Place Journal, is a progressive think-tank dedicated to re-forging the links between art and spirit, earth and society. Black Earth Institute encourages awareness of the arts as a means of promoting a progressive, inclusively spiritual and environmentally aware society. The organization gathers artists and audience members to further understanding of the historical role of the artist as bringing forth wisdom from beyond the self. Black Earth Institute promotes the oracle and orator, griot and druid, scientist and prophet, priest and priestess. We oppose the current definition of art as a commercial product derived from exploitation of personality and rewarded by celebrity and market status. We uphold the arts as a sacred path to wisdom, and we celebrate the artist as a seeker whose work benefits the entire human community. 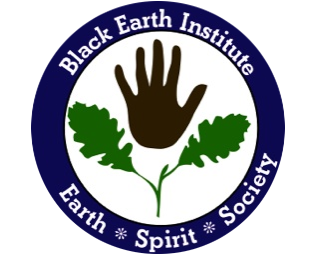 The emblem of Black Earth Institute begins with a circle that represents both the earth and the human community. Such circular emblems were used in ancient Greece as symbols of devotion to the localized earth goddesses called nymphs. Within the circle is a hand held open in greeting, a common symbol in many cultures for human connection. In the Middle East, it is the Hand of Fatima (Arab culture) and the Hand of Miriam (Jewish tradition), although its use as a sacred symbol predates both Islam and Judaism; called the hamsa, the open hand represents hopes for peace in the region. In the Americas, the hand crafted of shiny mica was a symbol, whose meaning is unknown, for the ancient Hopewell moundbuilder culture. Finally, the emblem includes two leaves of burr oak, native to the American prairies and able to survive prairie fires because of its thick bark. Together, these images speak to us of intercultural connection, respect for the environment, and acknowledgement of the sacred.